It's allmost like thumbing your nose at M$ and the companies that won't make plug-ins for Linux/Unix. KDE developers have done it again. Just when you thought Konqueror couldn't get any better it makes a quantum leap like this. Shockwave is amazing, having this on the Linux platform is a real plus plus and I want my Quicktime! KDE Team: Do you ever sleep? Konqueror is, all-round, the best browser in the world. Nothing else even comes close to its truly staggering featureset, its configurability, and its excellent usability. Well done KDE team! Lets keep the excellence (and releases) flowing and Konqueror will become truly world-changing. I think it's rather: "a question for the developers: are you interested in helping with the development of KJS ?" When Harri doesn't have time, KJS doesn't evolve much. pmk fixes the JS<->DOM stuff, but it seems the crashes we get now (the buglist is full of them), rather come from KJS itself. Disable JS globally in Konqi. There are so many sites which have reasonable fall-back code. If you enter this site of a German computer seller with JS on you cannot navigate their hardware list. If you try it with JS off, everything is fine. If you find a site where JS is a must have, enable it locally. What a difference. Congratulations all. Hey smart guy: ActiveX and .NET have nothing to do with each other. 'Kay, buh-bye now. Don't think so and see the future. PERHAPS in 2005 there will have just some .NET programs, so be carefull insulting things which may save you from Micro$oft softs!!! 1) I love Linux - I am not here to bash it. 2) KDE may deliver ActiveX support today, but Microsoft delivered it years ago. 3) .Net, as you may or may not know, is in beta right now, and the framework, from what I can tell, is really quite stable. There isn't much to complain about. The Visual Studio IDE is still a little problematic, but I have been using it at work without much difficulty. Anyway, it seems strange to me that a Linux guy would talk smack about beta software. That's pretty far along in the development stage considering the usual "something-0.0.0.0.0.1-pre-pre-alpha.tar.gz" that we're used to seeing. Look at the subject line. ActiveX and .NET are two very different things. There isn't some race between KDE's ActiveX support and GNU Mono. AFAIK, KDE has *no* support for anything resembling .NET, and there are not plans for it. This would put KDE behind GNOME in that sense. Actually, AFAIK, Mono isn't just a UI, but a CLI Runtime Environment and C# compiler. Thus, both GNOME and KDE can take advantage of Mono. As far as the ActiveX vs. Mono comparison goes, I think the poster was pointing out the KDE people just finished a major MS compatiblity project while the Mono people are saying they might be part way there [on an MS compatiblity project] by the end of the year. ...ActiveX support for Konqueror has never been mentioned before. I'm sure they were already working on it a few weeks ago. If they announced that they are working on this a few weeks ago, you wouldn't say this. And this is based on Wine's existing work, which is a lot less work than Mono. BTW, there's already code available for Mono. 1) .NET was designed to be more platform-independent. ActiveX is based on low-level MS API calls, many of which are un-documented or poorly documented. So, the ActiveX stuff is harder to implement. 2) .NET is extremely new and has very few uses in current Windows versions. ActiveX is everywhere, and every time a Linux product expands support for ActiveX, it is taking a major step in compatability, far more than any .NET project will offer. Wow, this would be really nice for streaming video plugins. Windows Media Player works under WINE already, so maybe the browser plugin does too? Can't wait to go home today and mess around! Geeze i'm becomeing more and more impressed with kde everyday. Much better than announceing what your going to do next year!! 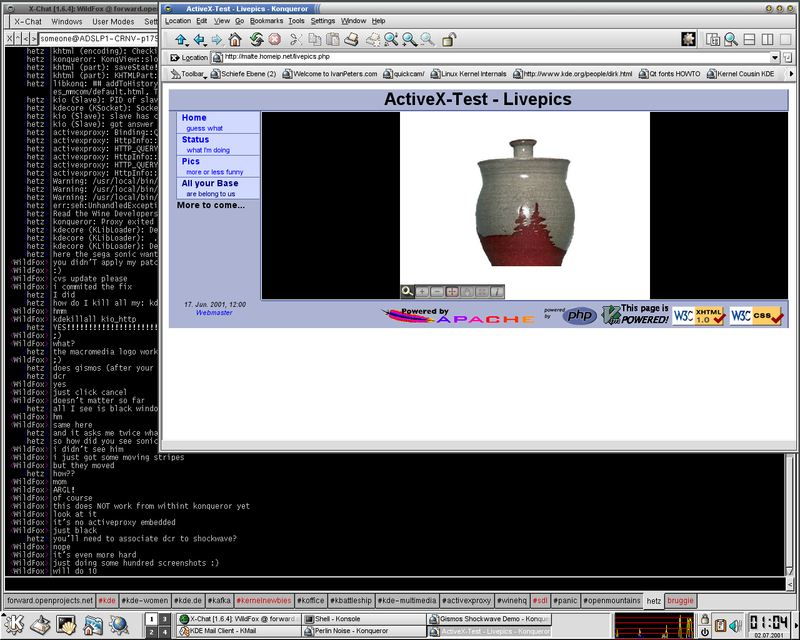 this was a 20 minute hack on Konqueror's part, WINE did the real work of getting ActiveX working on linux. so why stoke the stupid desktop war? Andreas, Malte, Nikolas: Don't take this personally, but I just have to say this. I find this article insulting. (Assuming for a minute that this is a good thing to have) It insults our non-ia32 users. Wine is not portable. To say that this helps Konqueror, and makes Konqueror the best browser on any platform, when this will only run on a few select platforms of KDE, dismisses all those users. Does Wine even run on all of the ia32 OSes that KDE runs on? So back in October, we were led to believe that KParts are the "next generation," as they are what Konqueror is based on. What changed? Why is suddenly ActiveX a great "obstacle" removed, and a "shot in the arm" for the browser? Is ActiveX superior to KParts? What obstacles were in front of us before? And why couldn't they be removed in the KDE way - using our libraries, following our UI standards, and using Free Software licenses? Lastly, this article attempts to speak for the reader in ways I think are unfounded. 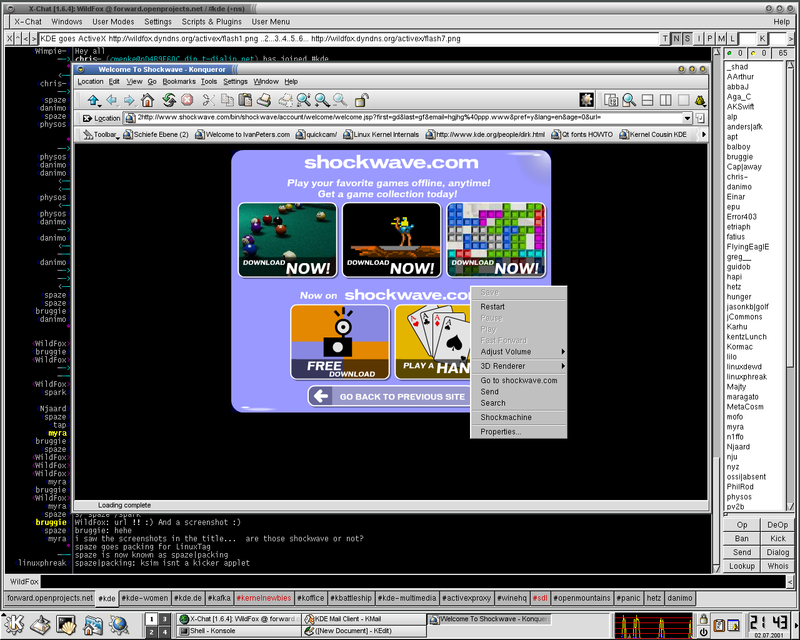 How can things like the Shockwave player be "popular," when there was no way to run them on Unix before now? Or is it implied that all KDE users are Windows users, or ex-Windows users? I see nothing wrong a developer for writing what he needs, and then sharing the results. I myself have an app in KDE that relies upon AOL servers. What I do think is wrong is when an article under the name of the head of the KDE League, on a site in the kde.org domain, makes these kind of assertions and implications about KDE and its users. Not everyone likes Windows, uses Windows, needs Windows, can run Windows, or even knows what runs on Windows these days. To portray the KDE community, and KDE apps, as aspiring to be Windows, is insulting. I wouldnt wory about that description of KDE2, kparts etc. It's a press release, and probably designed to be sent out to all sorts of journalists who might have no idea what KDE really it. It's standard practice to give background information about a company/product, inside a press release. As for why they've chosen to use wine etc to implement activeX support, rather than with KDE libraries, UI standards etc. I suppose there's nothing (theoretically :P) stopping any one of us from doing so. Don't criticise their hard work since they're giving it away for free (even is it's not the ideal approach). Actually WINE-based support is VERY important, AFAIK. Unless I've missed something, ActiveX is very platform specific, so implementing ActiveX API's using KDE libraries wouldn't do any good unless someone released an ActiveX control for Linux. And, if they did that, why not just release a KPart? By "any" platform, I believe it was meant that regardless of platform, Konq is the best browser. They did not mean Konq runs on all platforms... I mean, heck, they were comparing Konq against Netscape and even IE. It's not exactly fair playing ground since they all have various levels of portability. But if you could pick one that would work on your platform (defying all laws of portability), they are saying you would want Konqueror. Also, the majority of KDE users are Linux users. Many times you will see people speak of "Linux is now better" this-or-that because of something KDE-related. No one is forgetting about non-x86 users (at least programmers aren't) so there is nothing to worry about. WINE has always been x86-only. Now Konq can use it for ActiveX on x86 platforms. Could KDE come up with their own ActiveX type thing? Sure, although portability would be difficult (delivery system could send source and compile on target machine?). Does it mean having an x86-only alternative using WINE is a bad thing? I don't think so. I sort of see your point, but I believe you overreacted a little. >It insults our non-ia32 users. Wine is not portable. Okay. First of all, you're taking this _way_ too seriously. Nobody's insulting anyone here. Now that you've cooled off a bit, think. A feature that benefits some people makes Konqueror a better browser. Unfortunately, that feature is not available to you; however, that doesn't make the feature bad or detrimental to Konqueror, or insulting to you. Also, check out Bochs. (http://bochs.sourceforge.net) There is hope! >Is ActiveX superior to KParts? ActiveX is a different solution to a different problem. No one is suggesting giving up KParts now that we have ActiveX! The _only_ reason we want ActiveX is to be able to watch Shockwave movies and Sorensen/Windows Media encoded videos. We would prefer a *nix native solution if one came along, but we do what we can with what we've got. >How can things like the Shockwave player be "popular," when there was no way to run them on Unix before now? Shockwave is popular *on the Net*! Not, obviously, for KDE users, as they couldn't access it. Duh! >To portray the KDE community, and KDE apps, as aspiring to be Windows, is insulting. We don't aspire to be Windows. We aspire to watch Shockwave/Sorensen/WMP web content as Microsoft goes down in flames! > as Microsoft goes down in flames! That kind of obsession with Windows would harm KDE, if the development community engaged in it. KDE is no more in competition with Windows than it is with GNOME. Some organizations that package KDE may be, but KDE itself isn't. KDE just ships code. No more, no less. Sorry, I was kind of kidding about that. I certainly don't really believe Microsoft is going to go down in flames on KDE's part. They've got billions of $ to burn, and if KDE really starts to threaten them, they will just spend their money on making Windows better until it's better than KDE. They could do that for years without selling a single copy of Windows, with the cash hoard they've built up. Heck, they could probably do it on the interest on Bill Gates' personal fortune alone. So Microsoft isn't going down in flames anytime soon (unless the DOJ has a major change of opinion), and it's probably a good thing anyway. Thanks for pointing out Bochs! I certainly appreciate it! > to say this. I find this article insulting. of PC users are on Intel platforms. WINE has an X-type license. > are the "next generation," as they are what Konqueror is based on. > and a "shot in the arm" for the browser? Is ActiveX superior to KParts? > standards, and using Free Software licenses? those technologies until they become available natively. > be "popular," when there was no way to run them on Unix before now? > to be Windows, is insulting. > they deem it important enough. Of course people are free to use KDE in platform-specific ways, or in proprietary ways. That doesn't mean that the KDE news site, in the kde.org domain, has to act like they're a fundamental breakthrough for an open source project. > After all, WINE has an X-type license. Is Shockwave, or any of the other apps you suggest are useful with ActiveX, available under that license? You say that ActiveX is a shot in the arm for Konqueror. Obviously you mean that it's the use of these "popular" ActiveX components that is a great boon for Konqueror's users. If these non-free components are what you are celebrating, then this is a break from normal KDE practice - to get things working with free software. > Remember that "it's the apps, stupid". But let's look at what that expression means. By saying "It's the economy, stupid," the Clinton campaign meant that the economy was the number one, most important thing in the campaign, and in the country. All other issues were beneath it, and could be compromised for it. So, by saying "It's the apps, stupid," you're saying that just having these apps is more important than any other aspect of KDE, and that any other aspect of KDE can be compromised for having more apps. As I understand it, one of the fundamental aspects of KDE is that the apps are free. By championing ActiveX, you're implicitly putting it over all existing free KParts, and implying that freedom is not a valuable attribute for users of software to have. Is that what you mean to do, compromise freedom for more apps and users? Where would we be if, instead of having our own open source html renderer, we instead added hooks to use some internet explorer DLL to do the rendering? 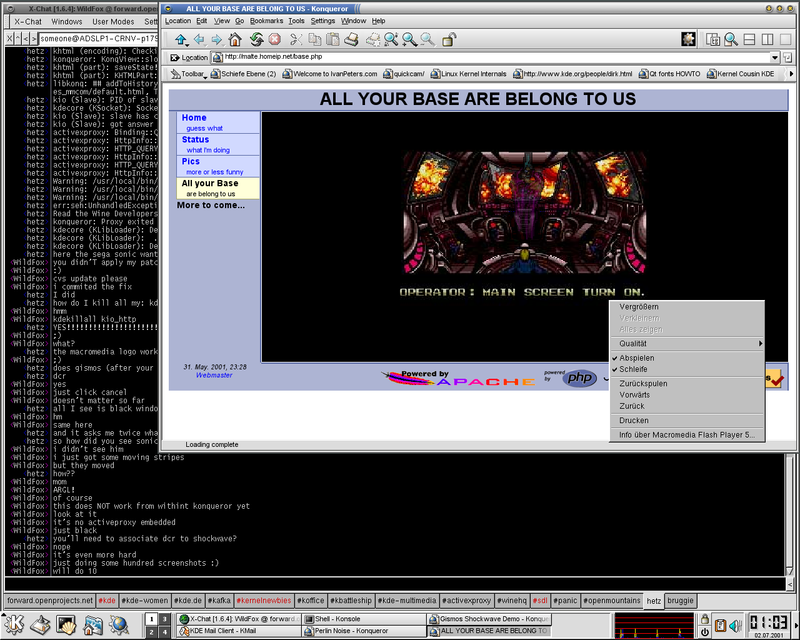 Or if aRts were as reliant upon non-free software as xanim? Be careful what you paraphrase. Well, plenty will be. Every KDE user not on ia32 will be. Do you mean to say that Konqueror is not a superior browswer on any platform where Wine isn't supported, because people there lack the ability to run these non-free apps? > that's not popular, I don't know what is! But what is your audience here? KDE Users and Developers, or "the web" in general? My impression of dot.kde.org was the former. Microsoft Office has a bunch of users, too. Would you make a thrilled post to dot.kde.org if someone ported the latest MS Office run under KDE, via wine? Would you call it the removal of a great obstacle, and dismissed KOffice as you've dismissed KParts here? > you might view it differently. What do you mean by mainstream? Mainstream Windows users? Are these "mainstream" users more important to you than the principles that got KDE where it is today? You know, at first, I thought the article was exaggerated in tone just in awe of Malte's and Niko's work. Now you've made it clear to me that there was no exaggeration. Your goalfor KDE seems to be that KDE should be used by as many people as possible, even if making that happen means running as much propreitary Windows software as possible. > for the great bulk of Linux/Unix users. Er, FYI, Wine is the "Wine Is Not an Emulator" project: a port of the Win32 API to unix, and a system for running Windows binaries under unix. This has everything to do with bringing proprietary Windows software to KDE. You seem to dislike the idea of any closed source programs running in Linux. Well, you're in the minority. I would love it if Microsoft Office (97 in my case) ran absolutely flawlessly under Linux (it runs off and on under Wine, but it would be lovely to have a native Linux port). Office is one of the jewels in the Microsoft crown, and my favorite word processor... although my favorite version was Word 2 (I've got the 4 floppies it came on sitting around somewhere :). However, I still find KOffice very exciting, not because it will replease Microsoft Office, but because it increases choice, variety and competitiveness. No-one has made any attack, actual or implied, on KParts. After all your long and rambling posts, I'm still not sure why you think there has been. Supporting ActiveX is exactly the same (and implemented in a similar, if more complicated way), to supporting closed Netscape plugins -- do you think that *they* are a threat to KParts as well? hahahaha... see the flamewar that spawned gnome for some perspective on that statement. It seems to me that KDE has always been about providing a Free desktop environment for *nix, even if that means using a few tools that aren't quite as "free" as some of the more rabid zealots would like them to be. Okay - let me understand what you are saying. > > After all, WINE has an X-type license. or not, ActiveX is a major technology. shouldn't have Netscape Plugin support? > that is a great boon for Konqueror's users. > > Remember that "it's the apps, stupid". > means. By saying "It's the economy, stupid,"
do for us? Apps are everything in a computer. > for more apps and users? You are blowing this way out of proportion. the way of embedding things like KHTML. serves a similar purpose to Netscape Plugins. > reliant upon non-free software as xanim? cater to the 1, and ignore the 49.
make an OSS ActiveX control for yourself. > impression of dot.kde.org was the former. probably would like to use "overall popular"
> Microsoft Office has a bunch of users, too. > KOffice as you've dismissed KParts here? time) be ported to a KPart can now be used. the idea of an "office suite." > that got KDE where it is today? > me that there was no exaggeration. > propreitary Windows software as possible. so. Will Apple make QuickTime open? Yeah right. software should be written? NO! ARE NEEDED by MANY, if not MOST people. Errmmm... just to point something out... KParts and ActiveX are two totally different animals. In fact, I'd wager that the the ActiveX implementation in kde is a Kpart. A Kpart is many times more powerful than activex and is used for embedding apps one within another regardless of what apps are being embedded where. ActiveX (afaik) is used principly for embedding web content plugins in MSIE. Think of kde's implementation as a wrapper for activex controls to be used as kparts within konq. Then, instead of swooning over ActiveX plugins being available, why not just write KParts for the desired functionality? now you ask those people who develop'd reaktivate to do just the same in 3 years more time (no, more) with legal risks because just ... you got 'insulted' by activex, not even because its bad. That's just what they did. The wrote a kpart component which allows graphical embedding of COM components. The fact that the backend is actually implemented using wine is an implementation detail. An important one, though, of course, as it's the only possible way to get stuff like shockwave running. But still for KDE it just means that there is a component available to which you can pass a URL to a shockwave file and it does the job. How performant and stable the whole thing is in the reality to the end-user still needs to be seen. But technically it's a very exciting thing and fun to implement/hack . (and fun is what counts when it comes to motivation in free software development) As it works, why not tell people about it? After all it's something completely new on linux (it's not that they just plugged in wine and it worked, they had to implement quite some stuff in wine itself and implement a good chunk of interfaces) . The fact that it runs only in x86 is a pity, but it's not their fault. Instead it's a design limitation of the underlying technology that simply can't be resolved. And given the fact that x86 is a popular KDE platform it's just a good reason to tell other KDE developers about this project. Maybe because the KDE developers don't have the time to rewrite Shockwave and Quicktime for KPart? Maybe because they can't afford the laywers when Apple comes down in one big swoop and sues the pants off of them for making anything even somewhat resembling the other "QT" without King Steven Jobs XIII for permission? I find this post insulting. It's exactly this kind of flame thrower silliness that builds up over time to cause some of the most talented developers to throw up their hands and just give up. I further hate the fact that I'm getting sucked into replying to such a troll. To your first point, the complaint you're getting at there should instead be directed to the Wine, not KDE folks. Unix applications are supposed to build from other widely supported libraries, and Wine certainly fits that description. 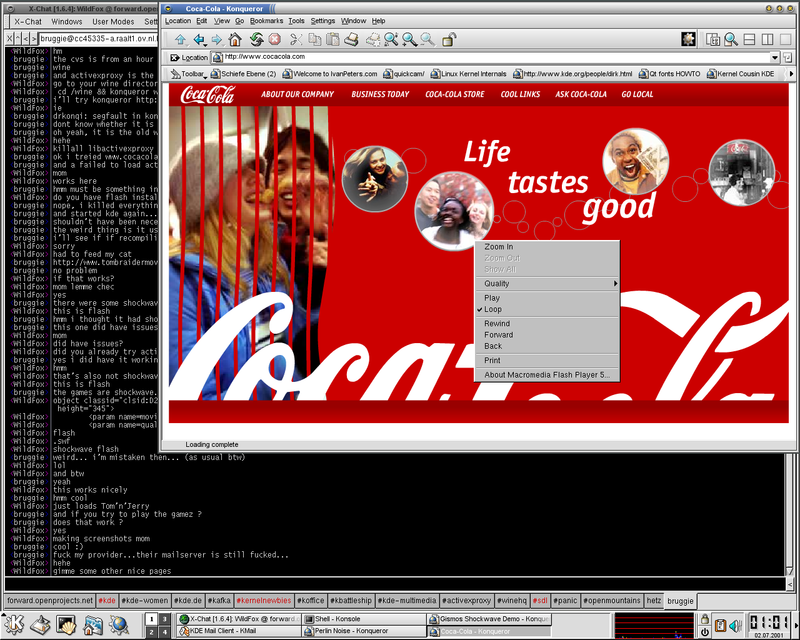 Second point: KParts is for connecting information paths within KDE applications. Where exactly do you get the notion that ActiveX is somehow to be used to fit that role? I can only assume that you decided to make that up as you went rolling along. Last point: I don't believe that there are 2 billion Chinese in the world, as none of them are in my house at the moment. That's the logical equivalent to your suggestion that Shockwave isn't a popular technology. It's this kind of mindless venom that does far more harm to open source software than anything Microsoft's PR department can come up with. Browser plug-in support is a huge hole for the *nix desktop, and these guys are well on the way of filling it. On top of that, they did so in a way that both stays true to the GPL, and the proprietary licenses of the plug-in creators. This is an accomplishment worthy of high praise, yet here I am instead responding to a troll. For the longest time we've been told over and over how wonderful KParts are. This is a complete misunderstanding. ActiveX does in no way replace KParts, those controls like Shockwave are not provided by reaktivate, they are used by it. You obviously didn't bother to have a look at the code before assuming it's some kind of KParts "replacement". If you did, you would have noticed that reaktivate is a KPart. Your argument sounds as if the following are true - (1) Non-Intel platforms are the most popular, and (2) Linux/UNIX has more market share than Windows. However, neither of these are true, and so the reality is we must recognize that. 1.) Supporting this as a big deal doesn't mean that no one cares about non-x86 users, it simply means that the x86 is the most popular platform, and thus if something works on x86, it works for most of us. 2.) Supporting ActiveX doesn't mean that it is superior to KParts, but when was the last time any major software developer released a browser plugin in KPart format. The KDE team obviously recognizes that the important thing is to support as many technologies as possible to insure support of most of the technologies we could ever want (just like they have made Konqi compatible with "broken" [read: MSIE-friendly] pages). 3.) Why do they call Shockwave popular? Because it is. Support for Unices doesn't make or break a product. Even support for Mac OS does very little. Support for Windows means everything right now. So, if a program is popular in Windows (i.e. 87% or so of the computer world), that translates as just plain popular. What a sour puss! Well Done KDE! Making Konqueror as feature packed as any M$ offering is what the public wants! To suggest otherwise is to relegate the best chance Linux has to become accepted and USED to the ash heap of past failures. I absolutely abhor Microsoft's marketing practices, their history of poorly cobbled together code and the poor value their products have represented. The public wants and needs an alternative that does what M$ products promised and deliver so poorly. And we want it without all the nonsense that comes from living with an agressive monopoly. Like it or not, Windows has set the standard for the kinds of features users want. If KDE and Konqueror are to succeed, they need to satisfy those needs the public now has and make the features accessible, affordable and an attractive alternative. To get rid of the security problems, why couldn't all ActiveX controls be run as a harmless user (such as the user nobody on most systems, who has no access to files)? It would seem pretty easy to implement. Does Shockwave really need disk access to function? Even if it does, it could be totally restricted to a single directory. You could even chroot it. Linux's security system is meant to prevent security fiascoes like ActiveX - we should use it! Brilliant idea! Make your reaktivate binary setuid nobody and chrooted /dev/null! why not start reaktivate in a dedicated wine-system as a sandbox. best would be a template, from wich the actual wine-system will be copied for every activex control. this way the control could do whatever it wants with this system... just kill the wine instance and you have a clean system again... am i wrong ? I'm not too sure if su nobody is easily possible given that usually nobody has no write access at all (apart from /tmp maybe). We need to install some files that we download and need to change WINE's registry. Running the whole thing chrooted is planned, though. However, it requires quite a few design changes. Stay tuned. intended for a different platform, but more securely. run MS DLLs with greater peace of mind?